Reputation & Reactions are an important part of communities across the internet. IPS Community Suite gives you the flexibility to set these up in a way which is suites your own community needs. From the basic settings screen, you can set up various overall settings, related to how reputation and reactions work on your site. You can switch the system on and off, as well as assign which groups are allowed to use this, and how to display the reputation items. One important item to note here, is the "Highlight content with positive reputation. 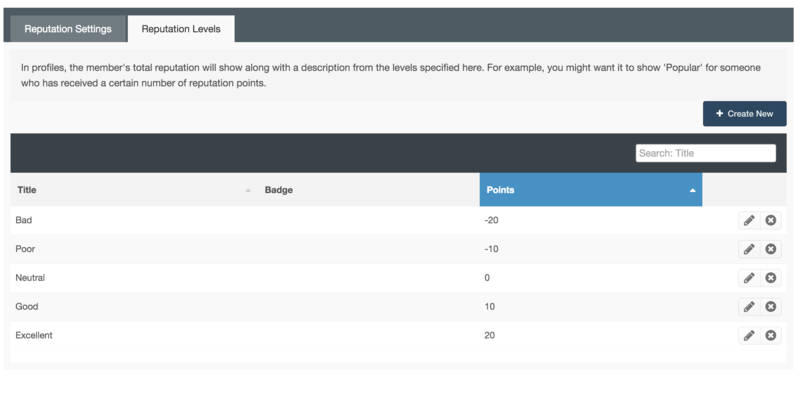 When this is set, topics will be highlighted when they reach the set reputation level, along with being given a reputation symbol in the top right to highlight the post has high reputation. On the reactions tab you will see a list of all the reactions that a user can give on your site. Each of these is given either a positive, a negative, or a neutral value. These are the reputation points in which a user will receive for a particular reaction. You can reorder these using the anchors on the left of each item. You can create new reaction items using the button in the top right of the screen. You will note that the 'like' item has no ability to delete. This is the default reaction, and is what is shown at in the reaction placement area on posts. Your users point at this icon in order to show other reactions, or click to give this reaction. Of course you can use the pencil icon to edit this to be anything you wish. The new Leaderboard is designed to better highlight your most active members and content based on reputation and other metrics. The Leaderboard will greatly enhance both member and content discovery on your community. Winners being highlighted within the profile when 'winning the day', and being added to the past members list. In turn, this can improve member participation on your site. From here, you can change various settings to determine what and how the leaderboard will display, or indeed if it will display at all. This can be helpful if, for example, you wish to exclude staff, or specific items, from being counted. Here you will see levels that can be gained upon reaching a set number of reputation/reaction points on your site. These can be given a reputation name and optionally an image. Clicking on "Create new" will give you the opportunity to add a new reputation level. The one I have created below as an example will give people the superstar reputation level with a star image upon hitting 1000 reputation points. Note: Within each member group, you can also set whether that group can see who has given reputation and the amount of reputation they can give in any one day.